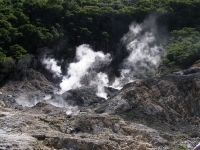 Known as the 'world's only drive-in volcano', Sulphur Springs - located near the gorgeous town of Soufriere - is a popular tourist attraction for visitors to St Lucia. Sulphur Springs is a dormant volcano (some scientists say that it is due to erupt within the next 100 years), and the on-going physical and chemical processes at the site are at once thrilling and deeply interesting to experience. The first thing you'll notice as you approach Sulphur Springs is the overwhelming smell of sulphur in the air - in fact, the presence of sulphur is so strong in the area that you shouldn't wear any silver jewellery in case it gets discoloured. Once inside, from the safe confines of a boardwalk tourists can gawk at seething, bubbling mud pots and their 50-foot steam vents rising from the volcanic crater, and admire the strange orange, purple and green streaks left on the surrounding rock by mineral deposits. The highlight of the visit is the chance to take a hot bath in the sulphur-enriched mud - which supposedly does wonders for your sinuses. A unique and exciting attraction, budget at least two hours to take it all in.